Japanese painting (絵画, kaiga, also gadō 画道) is one of the oldest and most highly refined of the Japanese visual arts, encompassing a wide variety of genres and styles. As with the history of Japanese arts in general, the long history of Japanese painting exhibits synthesis and competition between native Japanese aesthetics and the adaptation of imported ideas, mainly from Chinese painting which was especially influential at a number of points; significant Western influence only comes from the later 16th century onwards, beginning at the same time as Japanese art was influencing that of the West . Areas of subject matter where Chinese influence has been repeatedly significant include Buddhist religious painting, ink-wash painting of landscapes in the Chinese literati painting tradition, calligraphy of ideographs, and the painting of animals and plants, especially birds and flowers. However distinctively Japanese traditions have developed in all these fields. The subject matter that is widely regarded as most characteristic of Japanese painting, and later printmaking, is the depiction of scenes from everyday life and narrative scenes that are often crowded with figures and detail. This tradition no doubt began in the early medieval period under Chinese influence that is now beyond tracing except in the most general terms, but from the period of the earliest surviving works had developed into a specifically Japanese tradition that lasted until the modern period. The official List of National Treasures of Japan (paintings) includes 158 works or sets of works from the 8th to the 19th century (though including a number of Chinese paintings that have long been in Japan) that represent peaks of achievement, or very rare survivals from early periods. 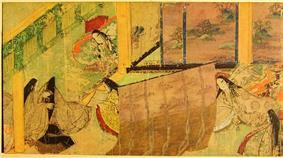 The origins of painting in Japan date well back into Japan's prehistoric period. Simple figural representations, as well as botanical, architectural, and geometric designs are found on Jōmon period pottery and Yayoi period (300 BC – 300 AD) dōtaku bronze bells. Mural paintings with both geometric and figural designs have been found in numerous tumuli dating to the Kofun period and Asuka period (300-700 AD). Along with the introduction of the Chinese writing system (kanji), Chinese modes of governmental administration, and Buddhism and Hinduism in the Asuka period, many art works were imported into Japan from China and local copies in similar styles began to be produced. With the further establishment of Buddhism in 6th and 7th century Japan, religious painting flourished and was used to adorn numerous temples erected by the aristocracy. However, Nara period Japan is recognized more for important contributions in the art of sculpture than painting. 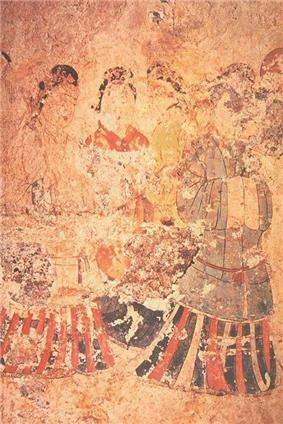 The earliest surviving paintings from this period include the murals on the interior walls of the Kondō (金堂) at the temple Hōryūji in Ikaruga, Nara Prefecture. These mural paintings, as well as painted images on the important Tamamushi Shrine include narratives such as jataka, episodes from the life of the historical Buddha, Shakyamuni, in addition to iconic images of buddhas, bodhisattvas, and various minor deities. The style is reminiscent of Chinese painting from the Sui dynasty or the late Sixteen Kingdoms period. 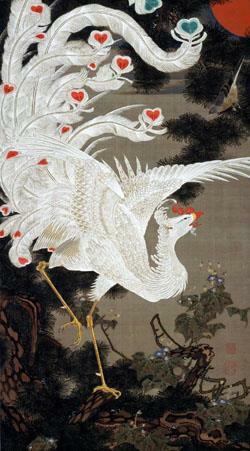 However, by the mid-Nara period, paintings in the style of the Tang dynasty became very popular. These also include the wall murals in the Takamatsuzuka Tomb, dating from around 700 AD. This style evolved into the (Kara-e) genre, which remained popular through the early Heian period. As most of the paintings in the Nara period are religious in nature, the vast majority are by anonymous artists. A large collection of Nara period art, Japanese as well as Chinese Tang Dynasty is preserved at the Shōsō-in, an 8th-century repository formerly owned by Tōdai-ji and currently administered by the Imperial Household Agency. With the development of the Esoteric Buddhist sects of Shingon and Tendai, painting of the 8th and 9th centuries is characterized by religious imagery, most notably painted Mandala (曼荼羅, mandara). Numerous versions of mandala, most famously the Diamond Realm Mandala and Womb Realm Mandala at Tōji in Kyoto, were created as hanging scrolls, and also as murals on the walls of temples. A noted early example is at the five-story pagoda of Daigo-ji, a temple south of Kyoto. With the rising importance of Pure Land sects of Japanese Buddhism in the 10th century, new image-types were developed to satisfy the devotional needs of these sects. These include raigōzu (来迎図), which depict Amida Buddha along with attendant bodhisattvas Kannon and Seishi arriving to welcome the souls of the faithful departed to Amida's Western Paradise. A noted early example dating from 1053 are painted on the interior of the Phoenix Hall of the Byōdō-in, a temple in Uji, Kyoto. This is also considered an early example of so-called Yamato-e (大和絵), or "Japanese-style painting," insofar as it includes landscape elements such as soft rolling hills that seem to reflect something of the actual appearance of the landscape of western Japan. Stylistically, however, this type of painting continues to be informed by Tang Dynasty Chinese "blue and green style" landscape painting traditions. "Yamato-e" is an imprecise term that continues to be debated among historians of Japanese art. The mid-Heian period is seen as the golden age of Yamato-e, which were initially used primarily for sliding doors (fusuma) and folding screens (Ban Dainagon Ekotoba uses a continuous narrative mode in order to emphasize the narrative's forward motion. These two emaki differ stylistically as well, with the rapid brush strokes and light coloring of Ban Dainagon contrasting starkly to the abstracted forms and vibrant mineral pigments of the Genji scrolls. 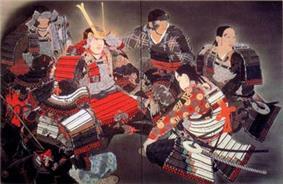 The Siege of the Sanjō Palace is another famous example of this type of painting. E-maki also serve as some of the earliest and greatest examples of the otoko-e (Men's pictures) and onna-e (Women's pictures) styles of painting. There are many fine differences in the two styles. Although the terms seem to suggest the aesthetic preferences of each gender, historians of Japanese art have long debated the actual meaning of these terms, and they remain unclear. Perhaps most easily noticeable are the differences in subject matter. Onna-e, epitomized by the Tale of Genji handscroll, typically deals with court life and courtly romance while otoko-e, often deal with historical and/or semi-legendary events, particularly battles. These genres continued on through Kamakura period Japan. E-maki of various kinds continued to be produced; however, the Kamakura period was much more strongly characterized by the art of sculpture, rather than painting. As most of the paintings in the Heian and Kamakura periods are religious in nature, the vast majority are by anonymous artists. During the 14th century, the development of the great Zen monasteries in Kamakura and Kyoto had a major impact on the visual arts. Suibokuga, an austere monochrome style of ink painting introduced from Sung and Yuan dynasty China largely replaced the polychrome scroll paintings of the previous period, although some polychrome portraiture remained – primary in the form of chinso paintings of Zen monks.Typical of such painting is the depiction by the priest-painter Kao of the legendary monk Kensu (Hsien-tzu in Chinese) at the moment he achieved enlightenment. This type of painting was executed with quick brush strokes and a minimum of detail. 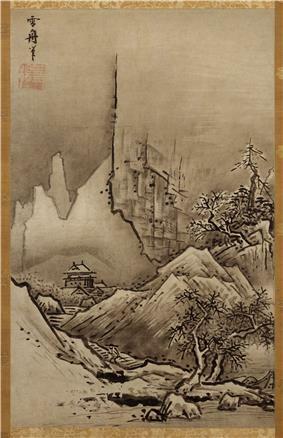 By the end of the 14th century, monochrome landscape paintings (sansuiga) had found patronage by the ruling Ashikaga family and was the preferred genre among Zen painters, gradually evolving from its Chinese roots to a more Japanese style. In the late Muromachi period, ink painting had migrated out of the Zen monasteries into the art world in general, as artists from the Kano school and the Ami school adopted the style and themes, but introducing a more plastic and decorative effect that would continue into modern times. 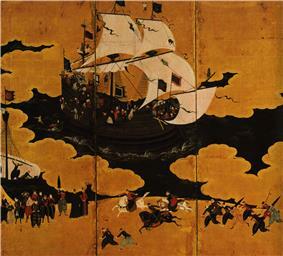 Screen detail depicting arrival of a Western ship, attributed to Kanō Naizen (1570–1616). In sharp contrast to the previous Muromachi period, the Azuchi Momoyama period was characterized by a grandiose polychrome style, with extensive use of gold and silver foil, and by works on a very large scale. The Kano school, patronized by Oda Nobunaga, Toyotomi Hideyoshi, Tokugawa Ieyasu, and their followers, gained tremendously in size and prestige. Kano Eitoku developed a formula for the creation of monumental landscapes on the sliding doors enclosing a room. These huge screens and wall paintings were commissioned to decorate the castles and palaces of the military nobility. This status continued into the subsequent Edo period, as the Tokugawa bakufu continued to promote the works of the Kano school as the officially sanctioned art for the Shogun, daimyo, and Imperial court. However, non-Kano school artists and currents existed and developed during the Azuchi-Momoyama period as well, adapting Chinese themes to Japanese materials and aesthetics. One important group was the Tosa school, which developed primarily out of the yamato-e tradition, and which was known mostly for small scale works and illustrations of literary classics in book or emaki format. Many art historians show the Edo period as a continuation of the Azuchi-Momoyama period. Certainly, during the early Edo period, many of the previous trends in painting continued to be popular; however, a number of new trends also emerged. One very significant school which arose in the early Edo period was the Rimpa school, which used classical themes, but presented them in a bold, and lavishly decorative format. Sōtatsu in particular evolved a decorative style by re-creating themes from classical literature, using brilliantly colored figures and motifs from the natural world set against gold-leaf backgrounds. A century later, Korin reworked Sōtatsu's style and created visually gorgeous works uniquely his own. Another important genre which began during Azuchi-Momoyama period, but which reached its full development during the early Edo period was Namban art, both in the depiction of exotic foreigners and in the use of the exotic foreigner style in painting. This genre was centered around the port of Nagasaki, which after the start of the national seclusion policy of the Tokugawa bakufu was the only Japanese port left open to foreign trade, and was thus the conduit by which Chinese and European artistic influences came to Japan. Paintings in this genre include Nagasaki school paintings, and also the Maruyama-Shijo school, which combine Chinese and Western influences with traditional Japanese elements. A third important trend in the Edo period was the rise of the Bunjinga (literati painting) genre, also known as the Nanga school (Southern Painting school). This genre started as an imitation of the works of Chinese scholar-amateur painters of the Yuan dynasty, whose works and techniques came to Japan in the mid-18th century. 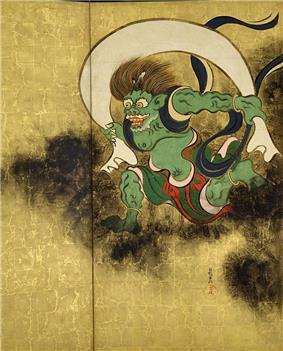 Later bunjinga artists considerably modified both the techniques and the subject matter of this genre to create a blending of Japanese and Chinese styles. The exemplars of this style are Ike no Taiga, Uragami Gyokudō, Yosa Buson, Tanomura Chikuden, Tani Bunchō, and Yamamoto Baiitsu. Due to the Tokugawa Shogunate's policies of fiscal and social austerity, the luxurious modes of these genre and styles were largely limited to the upper strata of society, and were unavailable, if not actually forbidden to the lower classes. The common people developed a separate type of art, the fuzokuga, in which painting depicting scenes from common, everyday life, especially that of the common people, kabuki theatre, prostitutes and landscapes were popular. These paintings in the 16th century gave rise to the semi-mass-produced woodcut print, or ukiyoe, which was one of the defining media of the mid-to-late Edo period. The prewar period was marked by the division of art into competing European styles and traditional indigenous styles. During the Meiji government. Western style painting (Yōga) was officially promoted by the government, who sent promising young artists abroad for studies, and who hired foreign artists to come to Japan to establish an art curriculum at Japanese schools. However, after an initial burst of enthusiasm for western style art, the pendulum swung in the opposite direction, and led by art critic Okakura Kakuzo and educator Ernest Fenollosa, there was a revival of appreciation for traditional Japanese styles (Nihonga). In the 1880s, western style art was banned from official exhibitions and was severely criticized by critics. Supported by Okakura and Fenollosa, the Nihonga style evolved with influences from the European pre-Raphaelite movement and European romanticism. The Yōga style painters formed the Meiji Bijutsukai (Meiji Fine Arts Society) to hold its own exhibitions and to promote a renewed interest in western art. In 1907, with the establishment of the Bunten under the aegis of the Ministry of Education, both competing groups found mutual recognition and co-existence, and even began the process towards mutual synthesis. The Taishō period saw the predominance of Yōga over Nihonga. 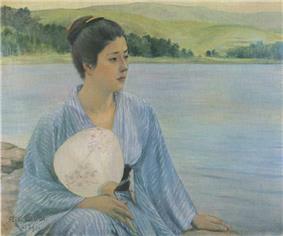 After long stays in Europe, many artists (including Arishima Ikuma) returned to Japan under the reign of Yoshihito, bringing with them the techniques of impressionism and early post-impressionism. The works of Camille Pissarro, Paul Cézanne and Pierre-Auguste Renoir influenced early Taishō period paintings. However, yōga artists in the Taishō period also tended towards eclecticism, and there was a profusion of dissident artistic movements. These included the Fusain Society (Fyuzankai) which emphasized styles of post-impressionism, especially fauvism. In 1914, the Nikakai (Second Division Society) emerged to oppose the government-sponsored Bunten Exhibition. Japanese painting during the Taishō period was only mildly influenced by other contemporary European movements, such as neoclassicism and late post-impressionism. However, interestingly it was resurgent Nihonga, towards mid-1920s, which adopted certain trends from post-impressionism. The second generation of Nihonga artists formed the Japan Fine Arts Academy (Nihon Bijutsuin) to compete against the government-sponsored Bunten, and although yamato-e traditions remained strong, the increasing use of western perspective, and western concepts of space and light began to blur the distinction between Nihonga and yōga. Japanese painting in the prewar Shōwa period was largely dominated by Yasui Sotaro and Umehara Ryuzaburo, who introduced the concepts of pure art and abstract painting to the Nihonga tradition, and thus created a more interpretative version of that genre. This trend was further developed by Leonard Foujita and the Nika Society, to encompass surrealism. To promote these trends, the Independent Art Association (Dokuritsu Bijutsu Kyokai) was formed in 1931. During the World War II, government controls and censorship meant that only patriotic themes could be expressed. Many artists were recruited into the government propaganda effort, and critical non-emotional review of their works is only just beginning. In the postwar period, the government-sponsored Japan Art Academy (Nihon Geijutsuin) was formed in 1947, containing both nihonga and yōga divisions. Government sponsorship of art exhibitions has ended, but has been replaced by private exhibitions, such as the Nitten, on an even larger scale. Although the Nitten was initially the exhibition of the Japan Art Academy, since 1958 it has been run by a separate private corporation. Participation in the Nitten has become almost a prerequisite for nomination to the Japan Art Academy, which in itself is almost an unofficial prerequisite for nomination to the Order of Culture. The arts of the Edo and prewar periods (1603-1945) was supported by merchants and urban people. Counter to the Edo and prewar periods, arts of the postwar period became popular. After World War II, painters, calligraphers, and printmakers flourished in the big cities, particularly Tokyo, and became preoccupied with the mechanisms of urban life, reflected in the flickering lights, neon colors, and frenetic pace of their abstractions. All the "isms" of the New York-Paris art world were fervently embraced. After the abstractions of the 1960s, the 1970s saw a return to realism strongly flavored by the "op" and "pop" art movements, embodied in the 1980s in the explosive works of Ushio Shinohara. Many such outstanding avant-garde artists worked both in Japan and abroad, winning international prizes. These artists felt that there was "nothing Japanese" about their works, and indeed they belonged to the international school. By the late 1970s, the search for Japanese qualities and a national style caused many artists to reevaluate their artistic ideology and turn away from what some felt were the empty formulas of the West. Contemporary paintings within the modern idiom began to make conscious use of traditional Japanese art forms, devices, and ideologies. A number of mono-ha artists turned to painting to recapture traditional nuances in spatial arrangements, color harmonies, and lyricism. Japanese-style or nihonga painting continues in a prewar fashion, updating traditional expressions while retaining their intrinsic character. Some artists within this style still paint on silk or paper with traditional colors and ink, while others used new materials, such as acrylics. Many of the older schools of art, most notably those of the Edo and prewar periods, were still practiced. For example, the decorative naturalism of the rimpa school, characterized by brilliant, pure colors and bleeding washes, was reflected in the work of many artists of the postwar period in the 1980s art of Hikosaka Naoyoshi. The realism of Maruyama Ōkyo's school and the calligraphic and spontaneous Japanese style of the gentlemen-scholars were both widely practiced in the 1980s. Sometimes all of these schools, as well as older ones, such as the Kano school ink traditions, were drawn on by contemporary artists in the Japanese style and in the modern idiom. Many Japanese-style painters were honored with awards and prizes as a result of renewed popular demand for Japanese-style art beginning in the 1970s. More and more, the international modern painters also drew on the Japanese schools as they turned away from Western styles in the 1980s. The tendency had been to synthesize East and West. Some artists had already leapt the gap between the two, as did the outstanding painter Shinoda Toko. Her bold sumi ink abstractions were inspired by traditional calligraphy but realized as lyrical expressions of modern abstraction. There are also a number of contemporary painters in Japan whose work is largely inspired by anime sub-cultures and other aspects of popular and youth culture. Takashi Murakami is perhaps among the most famous and popular of these, along with and the other artists in his Kaikai Kiki studio collective. His work centers on expressing issues and concerns of postwar Japanese society through what are usually seemingly innocuous forms. He draws heavily from anime and related styles, but produces paintings and sculptures in media more traditionally associated with fine arts, intentionally blurring the lines between commercial and popular art and fine arts. ^ """The Imperial Household Agency "About the Shosoin. Shosoin.kunaicho.go.jp. Retrieved 2013-04-21.